Recovery Aroostook, a Caribou-based addiction awareness organization formed last year, held their second annual overdose awareness vigil at 9 p.m. on August 30. 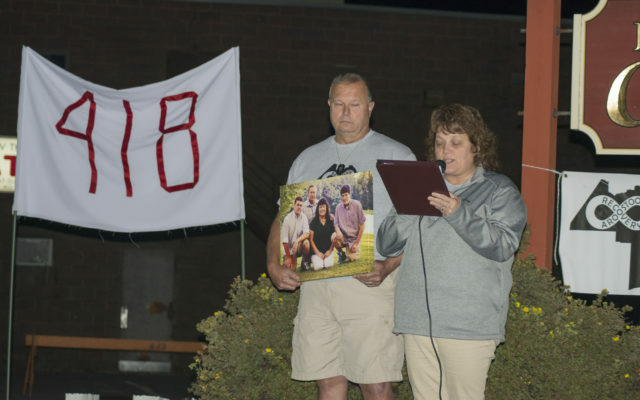 CARIBOU, Maine — Recovery Aroostook, a Caribou-based addiction awareness organization formed last year, held their second annual overdose awareness vigil at 9 p.m. on August 30. The event was held outside the Caribou Theater on Sweden Street following one of the city’s “Thursdays on Sweden” events. Last year, the event honored the lives of 378 Mainers lost to drugs. This year, that number is 418. Shelly and David Yankowsky of Glenburn told those attending how they lost two of their sons to drugs. Shelly, who works as a dispatcher, described Adam as “brave, smart and really funny.” They loved him unconditionally, and would “move mountains” for their children. After years of trying to help Adam however they could, whether it was obtaining medication for his depression and withdrawals or arranging counseling, he died for the first time on August 1 of last year, but medical personnel revived him with Narcan and treatment. Her husband David, who works as a state trooper, recognized that rigor mortis had already set in. Between his two deaths, Adam had been living with his parents and came home late one night from his restaurant job. In June of this year, their son Sean passed away after staying at a friend’s house. Shelly and David received a knock on the door and were greeted by the police and their priest. “You know it’s never going to go well when the priest is there,” she said. They informed the parents, who had lost one son less than a year ago, of Sean’s death. She said they now feel “empty” from dealing with the grief and a whirlwind of emotions at the two sudden losses in their family. Yankowsky said she and her husband have been sharing their story throughout Maine in the hopes that their experience can impact the community. David said it can often be difficult to handle a child who is fighting a battle with substances. The couple said it can be hard to accept that addiction can cause profound psychological changes in a person. Recovery Aroostook member Erik Lamoreau thanked everyone for coming out, and said that Maine is the “sixth worst state” for drug-related fatalities. After a moment of silence and the Serenity Prayer, the Yankowskys received gifts, including flowers and even a bag of Aroostook County potatoes.